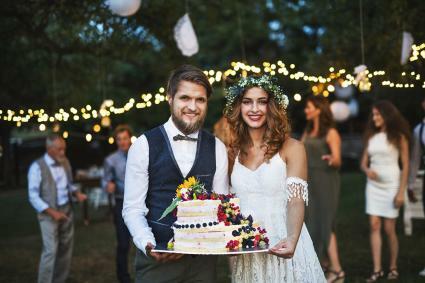 A BBQ is the perfect wedding theme for a couple who wants a causal affair that celebrates their love of the backyard favorites. However, even if you want a wedding that's more classy while still country, you have plenty of options for creating that perfect BBQ style. 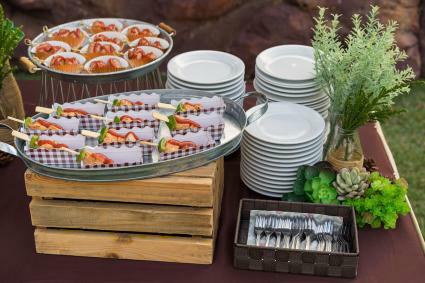 The menu is often the main event for a BBQ wedding. The food should be down-home delicious and nothing else will do. Settle on your menu and the rest of the wedding will come together. Children may not be as pleased with the classier menu selections, so be sure you have hot dogs and grilled corn on hand for them as well. The naked cake, or one that is very lightly frosted with the layers showing, is the perfect modern addition to a country wedding menu. You can incorporate florals from the wedding bouquets and guests can see your layers with ease. If you'd like a fruit topper or wedding-themed topper, feel free to add those as well. A BBQ wedding theme usually means you're trying to keep costs down, so it only makes sense to plan your decor accordingly. Burlap is cheap and a little more appropriate for a wedding than the red-checked tablecloth design usually associated with BBQs. Try these ideas for a backyard BBQ wedding on a budget. 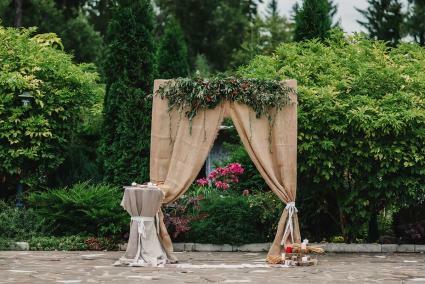 Set up a wedding arch that is covered in burlap. 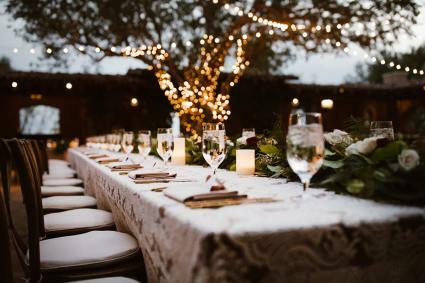 Add a greenery swag to the top, florals near the bottom, and a small cocktail table covered in burlap for candles and signing the marriage license. The tables at a backyard or rustic wedding are often styled with old-fashioned options. 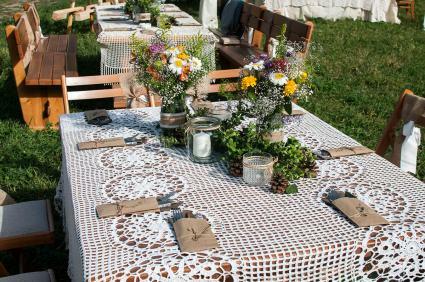 Take crocheted or lace tablecloths like your grandmother might have and drape tables with them. Add mason jars with candles and mixed bouquets of wildflowers. Wrap the jars in burlap. Place silverware in burlap bags and tied with twine. A few succulents add a contemporary feel. A casual country BBQ reception doesn't mean you're stuck with red as your color. Instead, consider using the rustic color combination of blue and yellow. 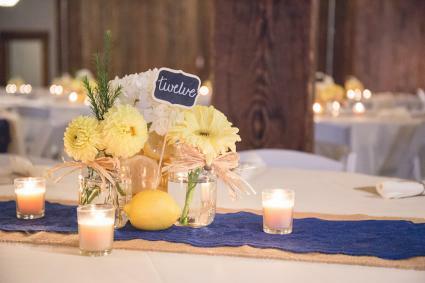 Add a touch of blue lace with some yellow citrus slices and mason jar flower bouquets with twine. 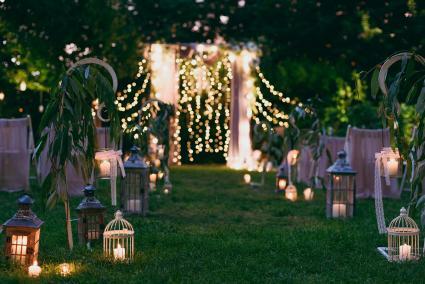 Lights and lace can elevate a rustic country wedding to a classy BBQ wedding reception or ceremony with little effort. Consider your basic country options and then take them up a notch to dress them up. An elegant wedding must have stunning lighting. Set up an arch and hang string lights between lace panels. Then line the aisle with lanterns and bird cages for a hint of that country feel without going overboard. Greenery on shepherd's hooks completes the look. Long tables with intricate lace tablecloths take center stage when it comes to the reception. Add a runner of greenery and white and red roses for an elegant display. Outside, cover tree trunks in white lights; inside, use tulle and lace to create backdrops for each wall. Even though you're planning a classy wedding with BBQ flair, it doesn't mean you still can't select red as your color. 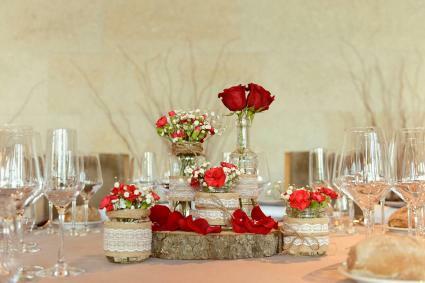 Consider using red rose bouquets and arrangements to incorporate the BBQ feel without the traditional checkered design. A few lace touches and some burlap complete the more elegant table design. The gown you select for your wedding should be one that reflects your theme. Simple A-line lace gowns can be dressed up or down, depending on the formality of your event. For a causal one, wear your hair down and accessorize with flowers and greenery. For an upscale event, put your hair up in a bun and add a few pearls for traditional elegance. 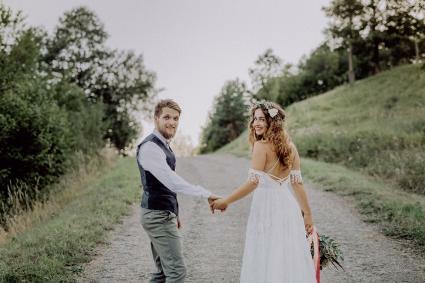 Grooms can wear vests without jackets, tan linen jackets, or a traditional suit. Outfit your bridal party according to your style. DIY s'mores kits - Package two chocolate miniatures, two large marshmallows, and four graham crackers in a cellophane bag. BBQ mitts - Pick them up in your wedding colors and add a wedding favor tag to thank everyone for attending. Grill rub mix - Reuse baby food jars or pick up small plastic containers. Mix up your favorite grilling spice rub and attach a thank you tag to the jar. 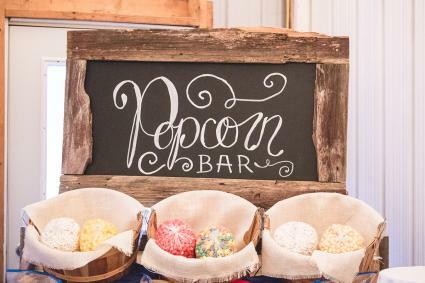 Popcorn ball bar - Make popcorn balls and package them individually. Stick to traditional caramel or add a little color to match your wedding. 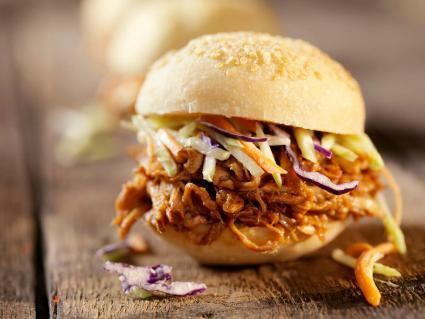 Have a smokin' wedding when you combine your love of BBQ foods with your nuptials. 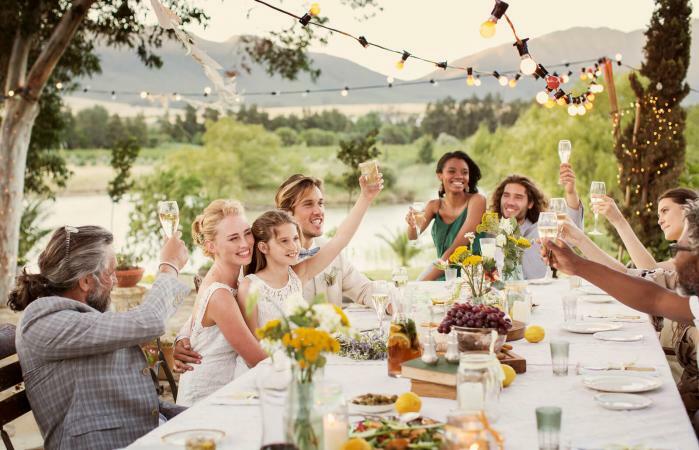 It doesn't matter if you want a more casual event or a fancy shindig, there are plenty of ways to make your personalities shine with this country theme.